In January 2013, Russia enforced a total ban on American adoptions after a Tennessee mother sent her seven-year-old adopted Russian son on a plane back to Moscow, alone. A more recently exposed scandal is that of American adoptive parents "re-homing" their uncontrollable Russian children by placing ads on the Internet. These transactions, privately arranged through lawyers, are estimated to be in the hundreds or even thousands. Yet the vast majority of the more than 60,000 Russian children that have been adopted by Americans over the past two decades—including many with physical or emotional disabilities—have benefited from loving and stable homes, and a high standard of care. 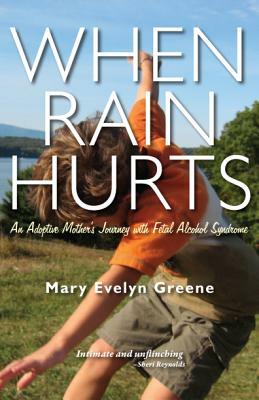 In her memoir, When Rain Hurts: An Adoptive Mother's Journey with Fetal Alcohol Syndrome, Mary Evelyn Greene tells the story of adopting two young Russian children. Greene was in her late thirties and her husband in his mid-fifties when they set their hearts on adopting from Russia. Not knowing how full of false starts the adoption process was, Greene rashly pinned her hopes and affections on grainy photographs and glowing reports transmitted by their Russian agency. Because of the high incidence of children with Fetal Alcohol Syndrome (FAS) in Russian orphanages and foster care, Greene and her husband asked an expert in detecting signs of FAS to review the fuzzy photographs and poorly produced videos that came via the agency. She broadcast news and photos of her prospective toddlers to family, only to have her hopes dashed as one after another future child was yanked from consideration. Greene writes that this experience was her first real encounter with psychological scarring: "Until we adopted, I had little experience with anger and primal wounds." A less naive person might have anticipated trouble. Greene’s dream repeatedly clashed with reality. Having spent thousands of dollars and precious months filing paperwork, Greene and her husband finally took their first trip to a remote Russian outpost only to discover the boy they'd set their heart on was clearly too ill to take on. There they were introduced to a two-year-old girl, and instantly fell in love. As is customary, they returned to the United States for a several-week waiting period while the machinery to adopt little Ekaterina was set in motion. They were anxious to also adopt a boy and complete their family on the second trip and got a special dispensation to forego a second waiting period if another child were available. Therein lay their dilemma. When they returned to finalize the adoption of Ekaterina—who they renamed Sophie—a host of mishaps arose. The orphanage administrators introduced the couple to a robust three-year-old boy who they said was healthy and available for adoption—and Greene and her husband had to decide on the spot whether to take him home. Their U.S. expert could not with any certainty judge from photos and films if the boy was affected by FAS. The little girl, it seemed, might not be released by the orphanage unless they also took the boy. Returning with two children, they were prepared to deal with relocation trauma, attachment issues, and malnutrition, and had a host of helpers at hand. While Sophie was bright and willful, the boy they renamed Peter was initially compliant, except for the fact that he seemed to take an immediate dislike to Greene, which is not unusual for orphanage children who equate adult females with the treatment they received from overworked orphanage matrons. While Sophie proved a chatterbox, Peter was a what Greene called a "pliable robot" who merely repeated random overheard phrases ad infinitum. There was a distant, detached, almost hollow quality about his demeanor, as though the boy we saw, the one we called Peter, was shielding someone else entirely—a child who was darker, more complicated, and definitely hurt. After six months, this boy "woke up in a primal scream" and became completely uncontrollable—defecating at will (though long toilet trained in Russia), and vomiting at every meal. His speech was primitive, he refused eye contact, and he was physically destructive. Greene says he went from being "like a cuddly toddler" to something "more like an explosive device." The family moved from Kingston, New York, across the Hudson River to Red Hook. Neither school system had a special education program appropriate for Peter's range of disabilities and mental health issues, which, when eventually diagnosed included, but were not limited to FAS, a middle place on the autism spectrum, sensory integration dysfunction, learning disabilities, bipolar and Post Traumatic Stress Disorder, and Attention Deficit Hyperactivity Disorder. Before he was six, Peter would be on anti-psychotic medicine. The book’s title refers to his ultra-sensitivities: "Mama, the rain hurts." Naturally, Greene experienced some bitterness, but the blame was one of "joint and several liability." She apportioned some to the former Soviet state, some to their adoption agency, and some to their own desire to be parents. "I was angry at the world, at God, for what felt like perpetual punishment, and all because we wanted a family." A doctor advised them to try "attachment coaching." They needed to treat Peter like a baby, so he could experience the developmental stages he missed in the orphanage. He and his mother were to spend the day entirely together, no more than six feet apart and share activities like meals and laundry in 15-minute increments. For the duration, little sister Sophie spent her days at preschool, while Greene’s husband worked off-site. "At times I felt we were breaking a horse," writes Greene before she realizes: "His entire repertoire of behaviors was designed to inoculate himself against the dangers of love and intimacy. I wasn't breaking a horse. I was nurturing a helpless foal." Greene goes from being hated by her son to being the person he's closest to, and the anti-psychotic medicine proved successful—for the first time they heard the words "I love you." The book jumps back and forth in time between the couple's adoption journey, which took place in 2003 and 2004, and Greene's journal, written from 2007 to 2010, and the story can be confusing at times. Details and people are introduced but not followed up on. I was left with questions in some instances and found myself wanting to know the back story. While there's no denying Greene's experience of Russia was often negative, the ordeal has colored her perceptions and she occasionally seems almost xenophobic in her disgust. She repeatedly refers to "Russia's unwanted children"—damning an entire people, rather than the tragic, complex mess of post-Soviet society. Still, Greene has come through an extraordinary trial both at home and abroad advocating for Peter. She is clear-eyed about the fact that both of her Russian-born children face unusual challenges, and she's ready to accept and love them as they are, not as she dreamed they would be. Christina Gombar has reviewed for The London Review of Books, Bookslut, Psychology Today, and The Huffington Post. She is the author of a volume of literary criticism, Great Women Writers 1900-1950. She formerly served as Literary Editor for Exhale, a magazine for women struggling to achieve motherhood. Her own fiction and memoirs—including one about her grandmother—have been internationally anthologized and recognized with awards.